What is the Credit Score Scale Range? In school, you get a grade that could fall anywhere from 0 to 100 based on some average of the work you did in class. The higher your grade, the better. Credit scores - the numbers that grade your creditworthiness - use the same concept. Your three-digit credit scores can range between two numbers and the higher your credit score, the better your credit is considered. There are different types of credit scores, and each of them has their own range. Most people are familiar with the FICO score version of the credit score. Scores on the FICO scale range from 300 to 850. According to FICO, it also has industry-specific FICO scores with a range from 250 to 900. You can purchase your FICO score by going to myFICO.com. A few credit card issuers - Discover, Barclaycards, and First National Bank of Omaha - include a free copy of your FICO score with your monthly statement. The VantageScore credit score is a fairly recent credit score developed by the three major credit bureaus - Equifax, Experian, and TransUnion. VantageScore 3.0 uses a 300 to 850 range similar to other credit scoring models. 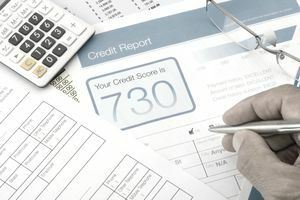 Earlier versions of the VantageScores range from 501 to 990 and give a letter grade A-F.
You can check your VantageScore for free through Credit.com, CreditKarma.com, LendingTree.com or Quizzle.com. None of these services requires a credit card or subscription. If you prefer, you can purchase your VantageScore directly from Experian or TransUnion. Most other credit scores, FAKO scores, range from 300 to 850. Banks may have their proprietary credit scores with ranges that only they know. Make sure you know the range for the credit score you're ordering to give you perspective on what your credit score means. Most credit score providers give you details about your credit standing when you order your credit score to take the guesswork out of what your credit score means.